Juveniles are more colourful and patterned compared to adults. As they age, their markings start to fade and their ground colour becomes darker, so by the time they reach adulthood, they are a plain, greenish-grey colour with black crossbar patterns running along their underside . The snout-to-tail length of a Bengal monitor is 61-175 cm and they can weigh up to 7.18 kg (although captive individuals can weigh 3 kg heavier). In the wild, these lizards can live for up to 11 years, but one captive individual lived for almost 22 years . 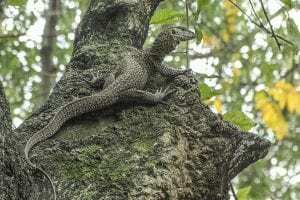 The two subspecies of Bengal monitors are Varanus bengalensis bengalensis and Varanus bengalensis nebulosus, and they were once thought to be two separate species. They differ in the size of the scales above their eyes and the number of scales on their body; Varanus bengalensis bengalensis has larger scales above the eyes and a greater number of scales . 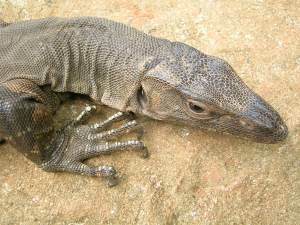 Bengal monitors range from Iran to Java, making them one of the most widely distributed varanid lizards . 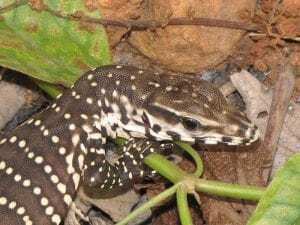 In contrast to other varanids, Bengal monitors are able to live in a wide variety of habitats, from semiarid deserts to places with seasonal snowfall – but they are generally more common in areas with a mean annual air temperature of 24°C . During cold periods, they are able to reduce their metabolic rate, and if there is a shortage of food, they can use energy from fat deposits in their tail. The habitat in which they live can affect their body size: longer individuals are generally found in areas with high soil moisture (e.g. marshes) and shorter individuals tend to be found in forests . 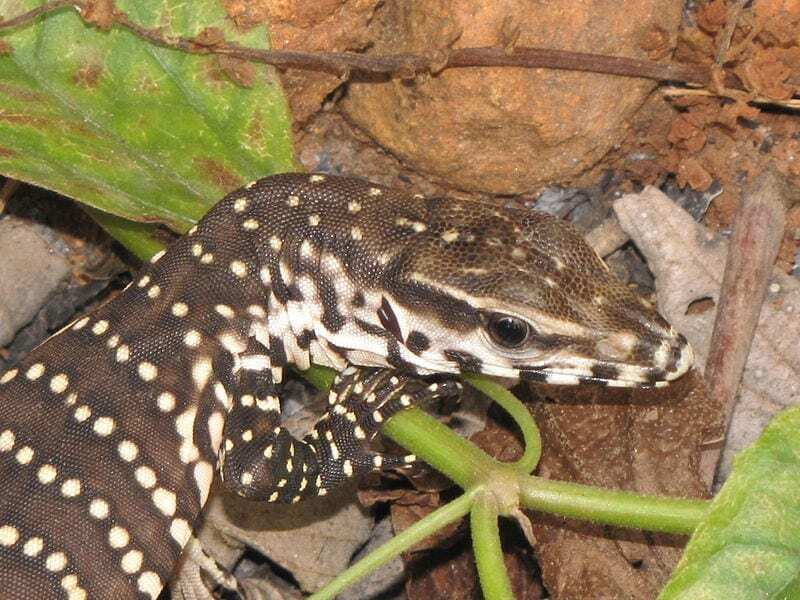 These lizards are almost exclusively carnivorous and will eat anything smaller than themselves. Their varied diet includes insects (beetles make up 52.8% of their diet), arthropods, eggs, ground birds, fish, rodents and other reptiles. Bengal monitors can be opportunistic and are known to scavenge on dead animals and even forage in dung to eat the insects inside. Some large adults even climb trees to hunt roosting bats. Bengal monitors are eaten by snakes, eagles, moongooses, dogs, feral cats and even other Bengal monitors. Juveniles are particularly vulnerable since they are so small . Bengal monitors are early risers and wake up at 6:00 in the morning to bask in the sun since they are ectothermic (cold-blooded) and need to use the environment to regulate their body temperature. They live a solitary life and are not very territorial. Their population density varies depending on the environment: just two individuals per km2 were recorded in a flooded evaporation basin in Rajasthan, India; a marsh in Pakistan had a population density of nearly 40 individuals per km2; and near agricultural land, there were 14-30 individuals per km2 . When two Bengal monitors meet, there can be conflict. This involves hissing, inflating the body to appear larger and tail whipping. This behaviour is more common between males and is used to establish dominance. Wrestling can also occur where they will stand on their hind legs and thrash their bodies, sometimes biting and clawing at each other . Here’s a video of two individuals fighting in Ranthambore National Park, Rajasthan, India. Bengal monitors are listed as “least concern” by the IUCN and one of the reasons for this is because they can utilise a wide range of habitats. However, Bengal monitors still face threats and they have even been eradicated in some parts of their range. They are hunted for food, their fat is used for medicinal purposes and their skins are often sold. Due to increasing human population, they will face greater threats in the future so their population size will need to be monitored .